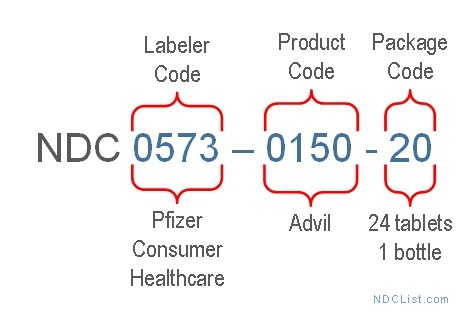 The National Drug Code or NDC is a unique numeric identifier given to each medication listed under the Drug Listing Act of 1972 (See Section 510 of the Federal Food, Drug, and Cosmetic Act (Act) (21 U.S.C. § 360)). The National Drug Code is divided in numeric 3-segments. The first segment identifies the product labeler (i.e., the manufacturer, marketer, repackager or distributer of the product). The second segment identifies the product itself (i.e., drug specific strength, dosage form, and drug formula). The third segment identifies the package size and type. For example, the NDC for 1 bottle with 24 tablet coated of Advil is 0573-0150-20. The first segment identifies the labeler, which in this case is Pfizer Consumer Healthcare with labeler code “0573”. The second segment “0150” is the product code for Advil (Ibuprofen). The third segment “20” identifies the package 24 TABLET, COATED in 1 BOTTLE. For insurance billing purposes the Centers for Medicare & Medicaid Services (CMS) created an 11 digit NDC derivative identifier. The CMS NDC identifier has 11 digits with no spaces, hyphens or other characters. If the NDC Package code is less than 11 digits the code must be padded with leading zeros. The leading zeros must be added to the appropriate segment to create a 5-4-2 configuration. For example, NDC 0573-0150-20 must be entered as 00573015020 for billing purposes.